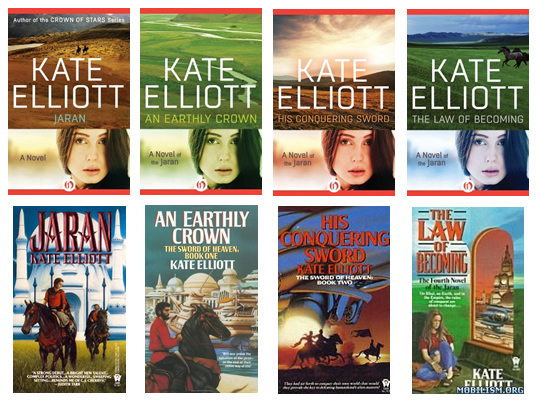 Open Road Media offers a special four-in-one e-book edition of Kate Elliott's sweeping and addictive Jaran series. (Or you can purchase each volume separately.) E-versions available worldwide at Open Road Media. In Jaran, the Earth of the future is just one of the planets ruled by the vast Chapalii empire. The volatility of these alien overlords is something with which Tess Soerensen is all too familiar. Her brother, Charles, rebelled against them and was rewarded by being elevated into their interstellar system. Struggling to find her place in the world, Tess sneaks aboard a shuttle bound for Rhui, one of her brother's planets. On the ground, she joins up with the native jaran people, becoming immersed in their nomadic society and customs. As she grows ever closer to the charismatic jaran ruler, Ilya (who is inflamed by an urgent mission of his own) Tess must choose between her feelings for him and her loyalty to her brother. In An Earthly Crown, the nomadic tribes of the jaran are uniting the settled cities of their homeland one by one. Their charismatic leader, Ilya Bakhtiian, has his loyal wife by his side, but there is something about her he doesn't know: Tess Soerensen is a human. Back home, her brother, Charles, led an unsuccessful revolt against the all-powerful Chapalii empire. Charles's insistence that Tess join him is as strong as Ilya's reluctance to part with his beloved wife and neither considers that Tess may have her own plans for the future. As three fiercely independent spirits struggle for a solution, the fates of both the human race and the jaran hang in the balance. In His Conquering Sword, the jaran have been taking over towns and bending all non-jaran to the law of their rule. With Ilya Bakhtiian in charge, the nomadic fighters are now preparing an assault on the royal city of Karkand. But within the campaign, another struggle looms. Charles, the brother of Ilya's wife, Tess, is still driven by thoughts of revolt. Charles travels to Rhui for key information about the past, hoping to bring back his sister his only heir. And in The Law of Becoming, Charles Soerensen's revolutionary inclinations have been reignited. In this final book, the story of Tess, Ilya, and Charles comes to its stunning conclusion as new generations get involved in the intrigue, Earth's exiled jaran people resurface, and the Chapalii overlords make one last, unexpected move. Read snapshot excerpts from each of The Novels of the Jaran books. "It’s an absorbing book with great characters that has had a lot of thought put into the universe and which gets the details right. There should be more SF like this." It's a series that makes you think, and that anyone with a love or appreciation of good worldbuilding will adore, but it's also an entertaining, addictive read. The omnibus edition is some 2200 pages, and I devoured it in a week." "I loved how heavily focused on romance and awesome character development Jaran turned out to be and how, at the same time, it offered great food for thought in terms of culture-clash and thought-provoking depictions of gender relations within the Jaran culture." "a beautifully complex and engaging novel that had me eagerly reading way past my bed-time!"